The Emerald Mile is the name of a Grand Canyon white water river dory, designed and built by John Litton in the 1960’s when Grand Canyon/Colorado river white water ecotours were just beginning. The book claims to be, “The Epic Story of the Fastest Ride in History Through the Heart of the Grand Canyon”, and in the broadest sense, it is. But the actual description of this “Epic Story” is included in just two of some twenty-seven chapters in the book. So what are the other chapters about? Part I (Chapters 1-3) is a history of European discovery of the Grand Canyon, various attempts to explore the region and John Wesley Powell’s epic first voyage down the Colorado through the depths of the canyon. Part II (Chapters 4-5) tells the story of our government’s focus on damming our wild rivers for flood control and hydro power, with a focus on the great Hoover Dam below the Grand Canyon and the Glen Canyon Dam just above it. Part III (Chapters 6-9) tells the story f the creation of the river dories and the golden age of river guiding. Part IV (Chapters 10-12) tells the story of an obsessed doryman named Kenton Grua, who made a successful speed run through the Canyon in the 1970’s. Parts V and VI (Chapters 13-20) detail issues arising from abnormally high rainfall in the Colorado River basin which threatened the integrity of the Glen Canyon Dam, necessitating an unusually high release of water from the dam, setting up the condition for the Emerald Mile’s speed run. Finally, in Part VII (Chapters 21-26), the story of the Emerald Mile’s speed run and its aftermath are told. So what do I think of this book? First, it is extremely well written and researched. The writing is very descriptive, even poetic in parts, and can evoke strong feelings in the reader, especially if they have a strong connection to the Canyon as I do. That being said, I felt that sometimes the author was pushing the descriptive prose a bit over the edge. But this didn’t happen often and was nothing more than an occasional annoyance. Fedarko’s research into all the aspects of the Canyon story is reminiscent of the several works by Eric Larson. Larson builds several different story lines that converge at some point on the central focus of the book. Fedarko’s book is like that, though perhaps not as clearly focused as Larson’s works. Sometimes it feels like Fedarko’s work wanders pretty far afield in building the story of the Emerald Mile’s epic speed run. 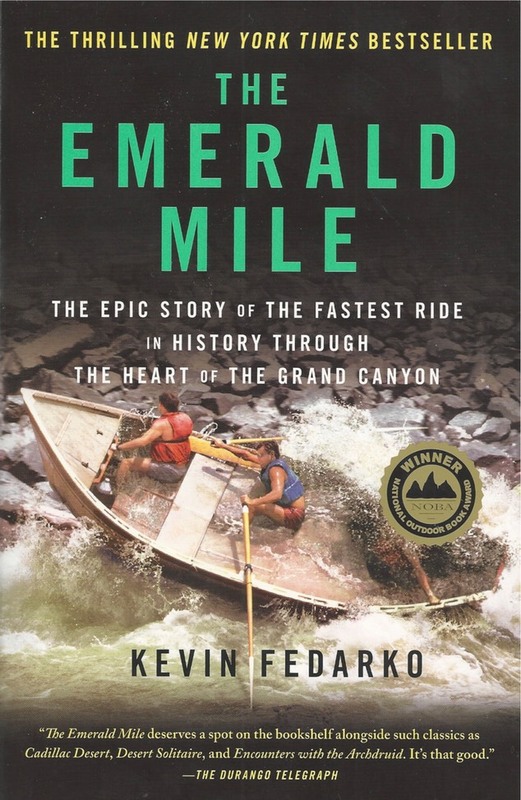 In fact, the speed run and the story of the Emerald Mile seem more like a vehicle to delve into a history of the Grand Canyon from the 1500’s to the present day, than a story about the speed run itself. If I had been clear about this focus as I began the book, I think it would have made more sense to me from the beginning. Still, as someone who has been to the Grand Canyon multiple times, who has hiked in twice and camped at the bottom once and has paddled and camped along the flat water Colorado from below the Glen Canyon Dam to Lees Ferry, the book really had a lot of meaning for me. I’m thankful to my wife, Lisa for giving me this book at Christmas on the recommendation of her son Brian, who read it and believed I would like it (Brian was on that camping trip into the Canyon many years ago , along with Lisa and my daughter Sarah). He was right. If you are as fascinated and awestricken by the grandeur of the Grand Canyon as I am, you will probably enjoy this well written and researched book. But don’t pick it up if you are only interested in an adventure yarn. You will be disappointed.